Our expertise is broad, and if there is a topic that you would like to have us assist you with and it is not listed above, please call and talk to us. We have a whole host of resources in our library. Some you can Borrow and some you can Keep. Please contact us or stop by if you would like to look through our resources available to you. -Lesson Plans and activities for ecology, streams, recycling, agriculture, etc. EnviroScape® – Available on Loan to Educators! The EnviroScape®’s are realistic demonstration models. They are great tools for use in demonstrating principles of how aspects of the environment; watersheds, wetlands, pollution, etc., work. They are ideal for all ages, kids to adults! 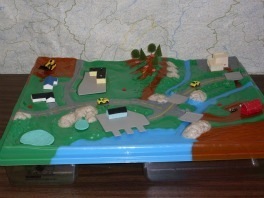 The Conservation District owns two different models which can be loaned to educators: Wetlands, and Watersheds & Non-Point Source Pollution models! If you borrow a model, it comes with instructions and all materials you will need. We do ask that if we need to restock an item, that you please let us know. 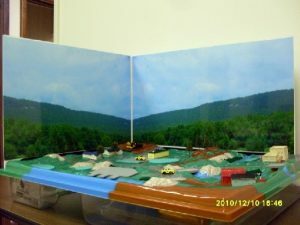 To borrow a model, please contact us at (717) 248-4695 to see if it is available and schedule a time to pick it up and sign it out. Descriptions of the models, environmental concepts, and ideas for using the models are listed below. For more ideas, and more detailed information, please visit the EnviroScape® website for more ideas and teaching methods. To get creative, we recommend using the User Tips and Sharing page on their website. The wetlands model is a great tool to teach about the importance of wetlands, their functions, and values to the environment and society. ·It can be used for lots of other demonstrations too! 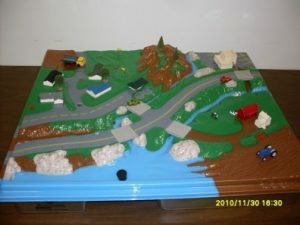 The Watersheds and Nonpoint Source Pollution Model is very versatile and it even illustrates Point Source Pollution! You can also borrow a scenic background for either or both of the EnviroScapes®. We have created this background because of the many requests for something that illustrates a forest, and a watershed better. This background can be used tobetter illustrate a common watershed in Mifflin County, or a mountain forest. Please Enjoy! These Video Links should help you in preparing a lesson, setting up the models, determining what parts to use, and maybe stimulate some ideas. These ideas may or may not work for an individual model, but most of the time they are adatable to multiple models. Enjoy! The Mifflin County Conservation District is always looking for opportunities to partner with schools, both private and public, or other education entities such as 4H, Child Development, etc. to enhance students learning of environmental and conservation issues. In the past we have assisted and partnered with schools to provide EnviroScape® demonstrations, plant trees for riparian buffers, perform stream assessments, and other resource related activities. If you have an idea and/or would like to partner with us for a project, in-class demonstration, teacher in-service day, or anything else, please contact us! We would be happy to assist you if we can. Grants for Schools Partnering with the Conservation District From time to time there may be grants available for schools to partner with us for hands on projects and field trips. If you are interested in this please let us know so that when the grants are available we will know who to contact. 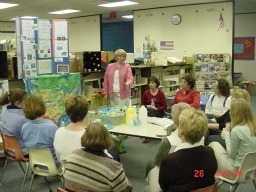 ·Surf Your Watershed – Created by the US EPA, a great education tool about YOUR watershed! ·PA Fish & Boat Commission Interactive Maps! 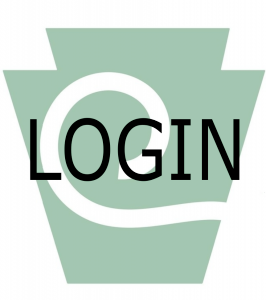 ·Online Mapping from the PA Spatial Data Access – Includes maps such as: PA Imagery Navigator, PA Atlas, national Weather Service, Interactice Place Finder, and A Map Gallery with Wildlife, Environment, and Geology maps! ·Penn State Youth & Teachers Natural Resources Extension – This is a great website with all kinds of resources that can be used in the classroom as well as LESSON PLANS created by teachers for teachers. You can even share your lesson plans!